PVC Covered Metallic Flexible Liquidtight Conduit For Cables Management in commercial and industry applications. Liquidtight flexible steel conduit (LFMC) is designed for a variety of installations requiring motion, vibration and bending. It offers good mechanical and moisture protection to enclosed conductors. 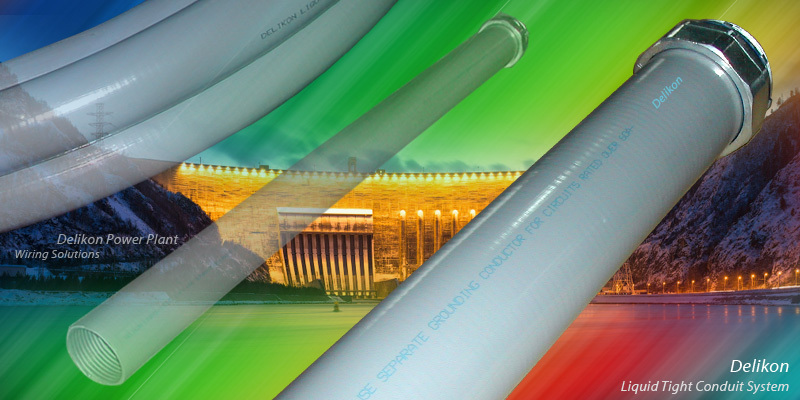 The inherent durability of the chemically stable PVC coating, which is also resistant to corrosion, impact, abrasion, and weathering, with the inner flexible metal conduit resistance to damage by rodents makes this liquid tight flexible conduit a best choice for construciton applications, power station and power transformers wirings. for both industrial and commercial wiring. *Inner core made from a spiral wound strip of high strength galvanized steel. *Unique Deli-LOK Locking and Sealing Mechanism with nylon cord packing for more strength, and increased moisture tightness. A smooth wipe clean PVC covering surface is keyed into the metal corrugations. *Liquid tight. Complete protection against most liquids and moisture vapor. Resists abrasion, weathering, heat, oil and chemical degradation. Metal Liquid Tight Conduit is manufactured from a galvanised steel flexible inner core which is pressure coated with an oil resistant, high temperature grade of plasticised PVC. The PVC is keyed into the corrugations of the inner steel flexible core, preventing the PVC from wrinkling when the conduit is bent to its minimum bend radius. 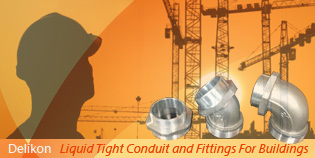 Liquidtight flexible metallic conduit provides protection for wiring circuits located in extremely wet or damp areas. It is also suitable for machines, tools and equipments where ruggedness is required. Delikon produces a whole range of electrical flexible conduit and fittings providing reliable cable management solutions for all kinds of cargo handling equipments. Interlocked liquid tight conduit for more frequent bending and moving applications. Also for tighter bend area. 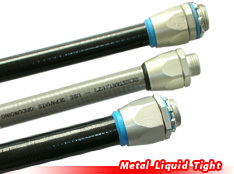 Liquid tight flexible metal conduits with metal wire over-braid for more abrasion resistance and EMI screening. Delikon Heavy Series Over Braided Flexible Conduit and Fittings For industry automation wirings. 5" & 6" large size liquid tight conduits are constructed with a fully interlocked strip for added strength and to prevent unraveling. Resistant to most industrial oils, acids and vapors. Large diameter liquid tight conduit and fittings are most suitable for bridges, ship, train station, stadium, power plant and railway power and sinal cables protection. Delikon produces a whole range of large size liquid tight conduit and fittings to meet your cables protection requirements in mega construction and engineering projects. 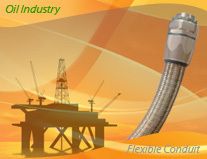 Delikon EMI Shielding Heavy Series Over Braided Flexible Conduit and Heavy Series Connector protect FLNG and LNG facility automation and process control equipment cables. Heavy duty, non-wrinkling smooth durable PVC jacket for exposed applications. Superior performance and appearance, creating a liquidtight conduit resistant to most oils, acids and vapors present in industrial environments. 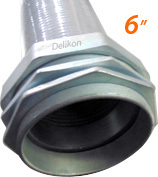 Delikon liquid tight conduit is suitable for use in a variety of environments and applications from general purpose wiring in wet or damp locations, to direct burial and in concrete embedment, to raised computer room floors and site lighting jobs. 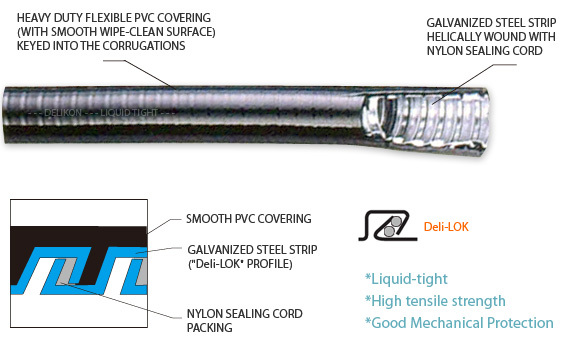 Delikon liquid tight conduit offers good mechanical and moisture protection to enclosed electrical conductors. Delikon IP67 Aluminum Liquid Tight Conduit fittings for industry automation Delikon aluminum liquid tight connector connects liquid tight conduit to electrical box, terminal box, and junction box. Delikon Patented Cone Shape Sealing Nut and Rubber Cone Gasket design provides increased liquid tightness, effectively keeping liquid and moisture out in demanding industry environments. The ferrule and body is machined as one sigle unit from high strength aluminium rod, offering excellent pull-off strength. For industry automation cable protection. Delikon produces a whole range of MS Plug Adapters for connecting a military connector (MS Plug) or circular connector to a flexible conduit for industry cable protection. In particular, the Over Braided Flexible Conduit with MS Adapter is most suitable for CNC machines wiring harness, industry control and automation cables protection. Over Braided Flexible Conduit, Fittings.Delikon Heavy Series Over Braided Flexible Conduit with MS Adapter for Servo Motor Cable.